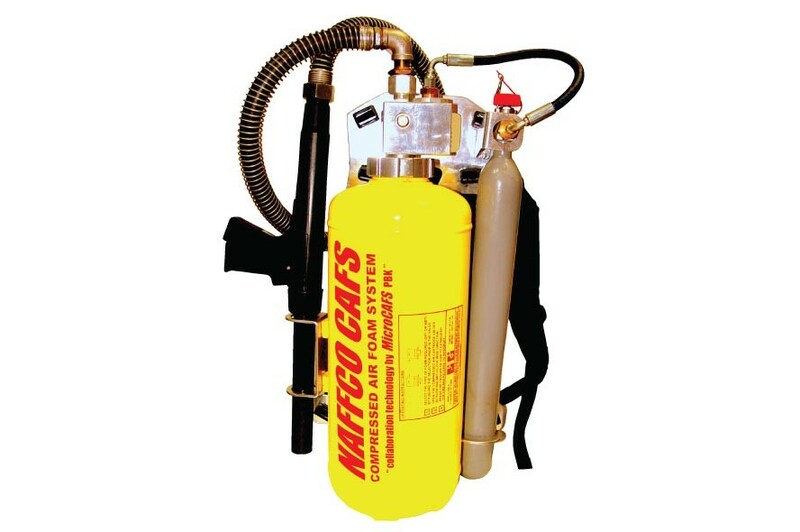 NAFFCO provides the highest quality of totally independent Compressed Air Foam (CAF) Hand held with Back pack system. It is more powerful than standard extinguishers, the multi-purpose CAF Hand held pack system can be used for fire suppression, exposure protection, hazardous materials cleanup as well as decontamination. The Hand held pack harnesses the strength of stored air energy in a comfortable backpack design. Ease of operation combines with rugged construction to create a portable CAF system that is reliable and ready for instant response in the most demanding situations. Two different type of foam- Wet & Dry, easily can be changed during operation. Excellent extinguishing capability when in use for highly flammable material i.e. burning plastics, rubber. NAFFCO.s CAF hand held back pack has Special high energy foam, which has 20 times effective wetting ability than plain water using expansion technology. Long discharge range of foam up to 40 feet (12.2m) enabling the user to maintain a safe distance from smoke, flame or heat. Developed for emergency response professionals, NAFFCO’s CAF hand held back pack has been deployed by military, fire professionals, hazmat teams and civilians.